Be sure to watch the videos below !!! Our Mechanical Surf Board is a unique amusement ride that will make you feel like you are riding insane waves without getting wet or having to go to Hawaii. Not only does this mechanical surf board look great and rock back and forth, it also spins unlike most other mechanical surf board rentals. Our mechanical surf board rental comes complete with an operator and features an LED timer to see how long you stay on the surf board. 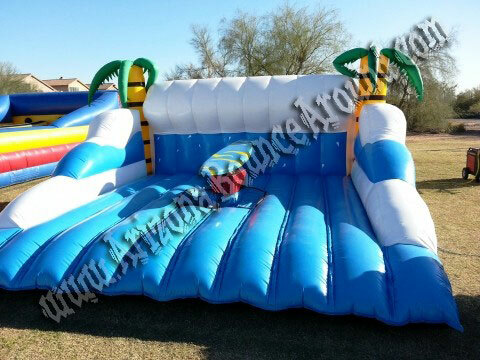 We have 2 different inflatable surf board mattresses to choose from including the tropical one shown or a beach style mattress with a big wave and sand looking floor. Both of our mechanical surf board mattresses have short sides so the spectators can see the people ride. Our mechanical surf boards can be used indoors or out, night or day and will make for some great Facebook memories. 360 degrees of waves makes this a challenge for the most advanced wave riders. With our pre-set modes we are able to give everyone the same exact ride every time, perfect for surf competitions or giveaways. 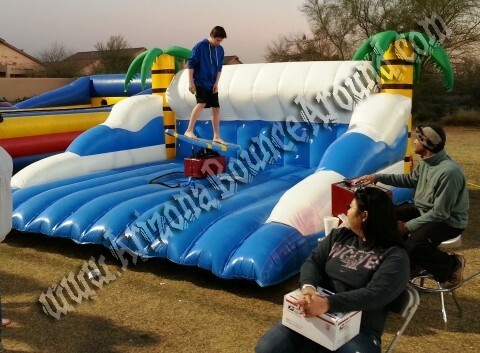 Mechanical surfing is perfect for school and church carnivals, elementary schools, middle schools, high schools, colleges and company picnics for kids and employees. My brother rented the mechanical surfboard thingy a couple weekends ago. It was so cool and fun. But most of all, the guy was super nice, professional, considerate and great with the kids. He was careful while still being fun too. Our time was running out and he didn't rush us or anything even though we had a full line of kids. He was really nice. His name is Dave. He gave all of us cards and told us they have a whole warehouse full of things. He is really good for business. Just wanted to pass along to Oscar!